Meanwhile, combine the ricotta, 1 1/2 to 2 cups mozzarella cheese, 1/2 cup Parmesan, and parsley. Add the garlic, salt, and pepper to taste, and mix. Stir the cooled meat mixture into the cheese mixture. Preheat the oven to 350 degrees F.
Brush the remaining 2 teaspoons of oil over a 13 by 9 by 2-inch glass baking dish. Spoon 1 1/2 cups of the sauce over the bottom of the prepared dish. Fill the manicotti with the cheese-meat mixture. 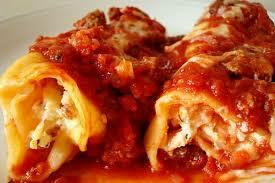 Arrange the stuffed pasta in a single layer in the prepared dish and spoon the remaining sauce over.